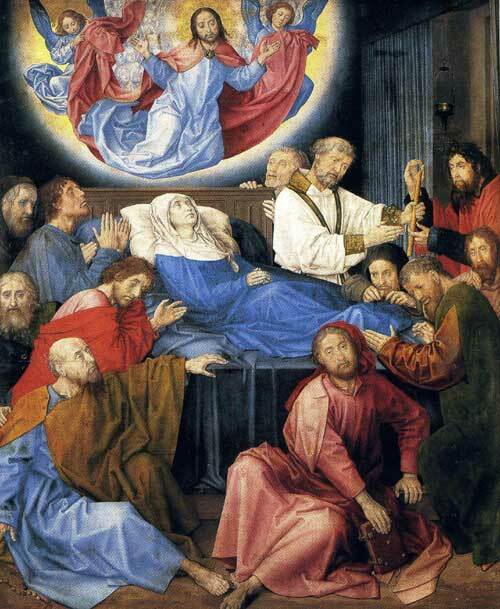 Hugo van der Goes was one of the most influential Northern artists of the latter 15th century. Born c.1440 in Ghent, Belgium little is known of his life story. He became a member of the painters guild of Ghent in 1467. Sometime after 1475, he entered a monastery near Brussels but he continued to paint. According to the records of a fellow monk, he fell ill becoming paranoid and suicidal believing himself to be damned. We can only speculate at the reasons for Hugo's melancholy illness, he died in Ghent in 1482. 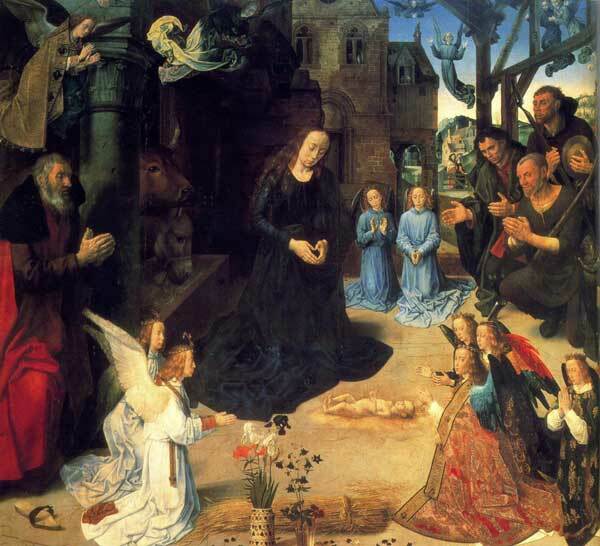 Van der Goes most famous work is the Portinari Altarpiece. This magnificent altarpiece is a triptych and was commissioned by Tommaso Portinari for the chapel in the hospital of Santa Maria in Florence. It is the artist's definitive work and forms the basis of his present-day reputation. The vast centre panel represents the Adoration of the Shepherds and is crammed with figures. The two wings depict Portinari and his sons praying in the presence of the Saints Matthew and Anthony and the Saints Mary Magdalen and Margaret protect Portinari's wife and daughters on the other wing. Portinari was a manager of the Bruges branch of the Medici bank and the work was transferred to Florence in 1483. This was the largest work from the North to be seen in Florence at that time. The painting can still be viewed today in the Botticelli room of the Uffizi. The Fall c.1479 (s). Oil on wood. Kunsthistorisches Museum, Vienna, Austria. 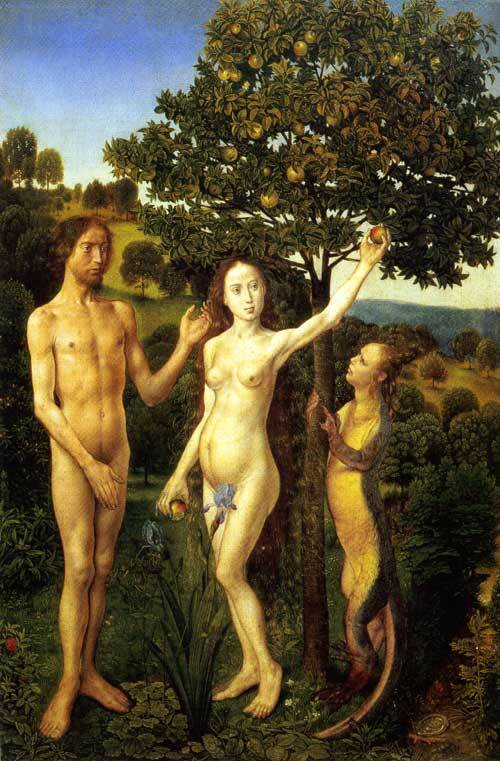 The fall of Adam represents the original sin in the Garden of Eden. The figures are typical Northern types who lack the muscular bulk associated with the Italian works of Michelangelo and Raphael, but they do display a realistic charm of their own. I particularly enjoy the strange snake-lizard-like creature with the human head who tempts Eve into picking the forbidden fruit from the tree of knowledge. The Death of the Virgin. c.1480. Oil on wood (s). Groeningemuseum, Bruges, Belgium. Van der Goes again displays his talent when rendering a scene crowded with figures. The Virgin is placed centre stage on a solid square bed. She is surrounded by the twelve elderly apostles who are shown in various postures their faces laden with sorrow and regret. Each of these figures has been painted as individual portraits adding a remarkable quality of life to the deathbed scene. Above the Virgin, floating in a circle of light, is the figure of Christ, held aloft by angels as he waits to receive the soul of his mother.